Common Knowledge (CK) is a pedagogical and technological innovation designed to guide knowledge community-driven science inquiry; and support collaboration across individual, small group, and whole-community social levels (Stahl, 2013) of a classroom. The technological aspect of CK is a multi-modal (e.g., tablets, laptops, interactive whiteboards) web-based discourse tool that visually represents a knowledge community’s ideas, to facilitate classroom inquiry discussions. CK’s design rests on a pedagogical framework informed by the Knowledge Community and Inquiry (Peters & Slotta, 2010; Slotta & Najafi, 2012) and Knowledge Building (Scardamalia & Bereiter, 2006) approaches to collective epistemologies for inquiry learning, incorporating inquiry and collaboration scripting (Dillenbourg & Jermann, 2007; Kollar, Fischer, & Slotta, 2007). CK has undergone several iterations , each one informed by classroom enactment data from the previous iteration. The most recent classroom enactment involved 2 classes of grade 5/6 students engaged in Astronomy inquiry. Students and teachers used CK throughout the unit to share knowledge, build on ideas, design investigations, and communicate outcomes. 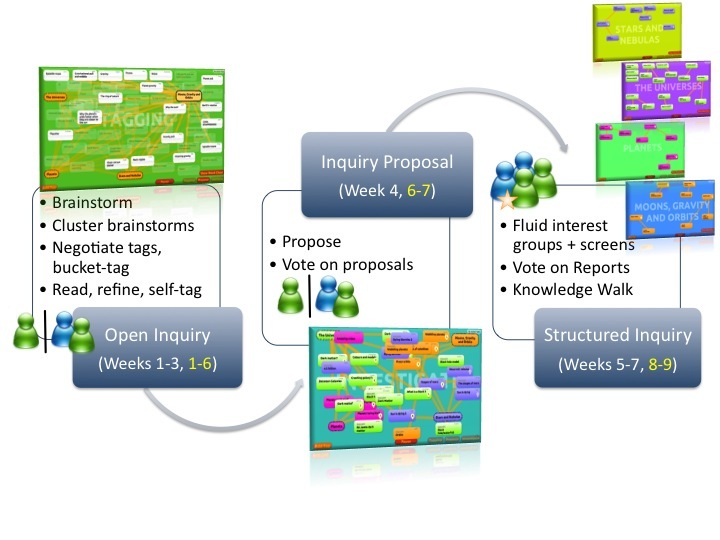 CK’s 8-week “primo-script” (Tchounikine, 2013) was designed to scaffold classes through 3 phases: open inquiry, inquiry proposal, and structured inquiry. The open inquiry phase begins with student-generated questions spurred by various classroom hook activities, which are then topically sorted by the community. Fluid interest groupings form around these topics, and students use their interest group’s questions to formulate proposals for inquiry trajectory and corresponding strategies, in the inquiry proposal phase. During this second phase, students may vote on the significance of any proposal – giving the community an opportunity to collectively drive the uptake of various inquiry trajectories. In the third structured inquiry phase, students work in fluid interest groups to carry out the proposed investigation(s), collecting data/information and reporting on findings. Students have the option of proposing further inquiry trajectories and strategies, as may arise from their structured inquiry investigations. Throughout this third phase, students are encouraged to make conceptual connections between findings from their own investigations and their peers’, as they spontaneously move between interest groups. Students may indicate such connections on any particular peer contribution via a voting tool. This offers the community an opportunity to collectively approach knowledge convergence between inquiry topics. Overall, this was the intended pedagogical flow of the knowledge communities’ inquiry in the two grade 5/6 classrooms that CK was enacted in, and analysis is underway to determined if the underlying objectives for this flow were actually realized. Furthermore, Teachers used CK discussions as launching points for oral classroom discussions to guide the inquiry. Analysis focuses on the role of CK content within teacher-led discourse, including how CK enabled new discourse moments, and motivated inquiry through visualizations of progress, conflict, or unmet need. Copyright © 2019 Encore Lab - .